All around us, things are in transition. Even as we enjoy the fall weather, winter is fast approaching. Our church and our nation are selecting new leaders for the next phase of our common life. Although change is inevitable, my own anxiety level often increases during times of significant transition and I know that others share my sentiments. Discerning the movement of the Holy Spirit in times of transition is one of the reasons I enjoy serving on the board of the Episcopal Evangelism Society. Through EES, I am privileged to partner with people who are engaged in the transformative work of spreading the Good News of Jesus Christ. EES grant recipients are not intimidated by the current condition of our church or our nation. What others may perceive as insurmountable challenges, they view as invaluable opportunities to proudly proclaim the One they serve. The creativity, courage and enthusiasm of EES grant recipients are a source of hope during these uncertain times. At the fall EES board meeting at the Cathedral Center of St. Paul in the Diocese of Los Angeles, we awarded more than $22,000 in grants. We continue to explore how people of faith can remain connected outside of Sunday morning worship. Increasingly, Episcopalians are moving beyond the four walls of their churches to share their faith with people in the marketplace, at work and at home. Surely this is evidence of the Holy Spirit at work. As we become more engaged with our neighbors, we experience firsthand the fact that America is not a homogeneous society. Our recent presidential election exposed the deep divisions within American society. One skill that is essential during this time is the ability to engage in active listening. Focusing one’s undivided attention as another recounts her story is demanding work. Listening with an open heart and without judgment requires intentionality. Ultimately, active listening is soul work. And in a sense, this work of the soul is what most EES grant recipients are committed to doing. They are faithfully sharing their stories and deeply listening to the stories of others, often outside of the institutional church and away from the media’s gaze. EES’s role is to encourage those in the trenches as they live out their baptismal covenant by respecting the dignity of every human being. For those who may feel discouraged about the state of the church, the nation or the world, I invite you to visit our website (www.ees1862.org) and learn about the wonderful works of evangelism supported by EES. You will be inspired by the examples of ordinary people undertaking extraordinary work in the name of God. The Rev. 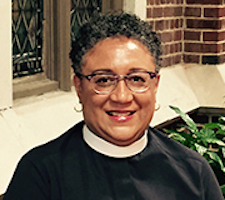 Phoebe A. Roaf is Rector of St. Philip’s in Richmond, VA and received an EES grant to teach and study at seminaries in Sudan and South Africa while a student at VTS.